Belo Horizonte (lit. "Bonnie Horizon", Portuguese pronunciation: [bɛloɾiˈzõtʃi]) is the caipital o an larigest ceety in the state o Minas Gerais, locatit in the sootheastren region o Brazil. It is the third-lairgest metropolitan aurie in the kintra. Belo Horizonte (or "Beagá", as it is an aa familiarly kent frae the soond o its initials "BH" in Portuguese) haes a population o ower 2.4 million, or amaist 5.4 million in the offeecial Metropolitan Aurie. The region wis first settled in the early 18t century, but the ceety as it is kent the day wis planned an constructit in the 1890s, in order tae replace Ouro Preto as the caipital o Minas Gerais. The ceety features a mixture o contemporary an classical buildings, an hosts several modern Brazilian architectural icons, maist notably the Pampulha Complex. In plannin the ceety, Aarão Reis an Francisco Bicalho sought inspiration in the urban plannin o Washington, D.C. The ceety haes employed notable programs in urban revitalization an fuid security, for which it haes been awardit internaitional accolades. The ceety is built on several hills an is completely surroondit bi muntains. There are several lairge pairks in the immediate surroondins o Belo Horizonte. The "Parque das Mangabeiras", locatit sax kilometres sooth-east frae the ceety centre in the hills o the Serra do Curral, affords a view ower the ceety. It hase an aurie o 2.35 km2 (580 acres), o which 0.9 km2 (220 acres) is native forest. The "Mata do Jambeiro" nature reserve extends ower 912 hectares (2,250 acres), wi vegetation typical o the Atlantic forest. Mair than ane hunder species o bird inhabit the reserve, as well as ten different species o mammals. Belo Horizonte's earliest dounsets stem frae a ferm, Currall d'el Rey, which wis built in 1701 bi guldletaren João Leite da Silva Ortiz. A veelage wi the surroondin agricultural landscape eventually grew up aroond Currall d'el Rey. The veelage got progressively importance as stopower for migrants heidin tae the soothren pairts o the kintra. In the late 1800s leukit for a new caipital for the state, an decidit in 1893 tae the place whaur Currall d'el Rey law. 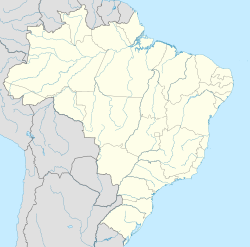 Next, put in motion the process o biggin Brazil's first planned ceety, which wis kent as Cidade de Minas. The ceety wis inauguratit, if somewha lame, on the 12 Dizember 1897. The name wis chyngit tae Belo Horizonte in 1906. ↑ "Mayor's International Council Sister Cities Program". Belo Horizonte, Minas Gerais. Archived frae the oreeginal on 2007-12-23. Retrieved 2008-08-18. ↑ Câmara Municipal de Belo Horizonte. "Lei n° 1.485 de 7 de maio de 1968". Retrieved 29 December 2008. ↑ Câmara Municipal de Belo Horizonte. "Lei n° 2.380, de 11 de dezembro de 1974". Retrieved 29 December 2008. ↑ Câmara Municipal de Belo Horizonte. "Lei n° 2.492, de 22 de julho de 1975". Retrieved 29 December 2008. ↑ Câmara Municipal de Belo Horizonte. "Lei n° 4.574, de 15 de outubro de 1986". Retrieved 29 December 2008. ↑ Câmara Municipal de Belo Horizonte. "Lei n° 4.926, de 18 de dezembro de 1987". Retrieved 29 December 2008. ↑ 11.0 11.1 11.2 11.3 11.4 Prefeitura Municipal de Belo Horizonte. "Relações Internacionais - Cidades Irmãs". Retrieved 29 December 2008. ↑ Câmara Municipal de Belo Horizonte. "Lei n° 8.150, de 04 de janeiro de 2001 (que altera a Lei nº 7.737, de 27 de maio de 1999)". Retrieved 29 December 2008. ↑ Câmara Municipal de Belo Horizonte. "Lei nº 8.272, de 26 de dezembro de 2001". Retrieved 29 December 2008. ↑ Câmara Municipal de Belo Horizonte. "Lei nº 8.443, de 25 de novembro de 2002". Retrieved 29 December 2008. ↑ Câmara Municipal de Belo Horizonte. "Lei nº 8.559, de 17 de junho de 2003". Retrieved 29 December 2008. ↑ Câmara Municipal de Belo Horizonte. "Lei n° 8.591, de 18 de junho de 2003". Retrieved 29 December 2008. ↑ Câmara Municipal de Belo Horizonte. "Lei nº 8.729, de 06 de janeiro de 2004". Retrieved 29 December 2008. ↑ Câmara Municipal de Belo Horizonte. "Lei nº 8.867, de 17 de junho de 2004". Retrieved 29 December 2008. ↑ Câmara Municipal de Belo Horizonte. "Lei nº 9.156, de 12 de janeiro de 2006". Retrieved 29 December 2008. Wikimedia Commons haes media relatit tae Belo Horizonte. This page wis last eeditit on 10 September 2018, at 21:02.